After my guest post of last week, Riccardo asked me to provide a brief description of Stridonium. I'm often asked about the name. It's called Stridonium after the birthplace of Jerome, the patron saint of translators. Stridonium was set up five years ago with the help of colleagues who were interested in creating a private internet community for professional translators. As you can see from the site’s home page on the site, we aimed to create a place where seasoned professionals and dedicated newcomers could meet to exchange views, seek advice and ultimately to help further the interests of – and hopefully raise standards in – the translation industry. 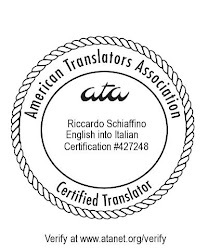 Basically, we wanted to provide a venue for professional translators to interact in a collegial spirit of give and take, with no advertising and no attempts to sell products or services to members (and no moderators). The decision to make Stridonium a private forum was a conscious one, so that members’ posts lie beyond the reach of Google and other search engines (although because the private nature of the site forbids direct viewing by non-members, we did produce a presentation to give language professionals who are interested in joining Stridonium an insight into the community). It was also a conscious decision to apply relatively strict membership criteria. Over time, the site has also become a platform for organising a limited number of specialist workshops and lectures and of course the "Business in Communication" conference in March this year. Also for this year, we have organised three lectures by Stuart Bugg (for lawyers, legal editors and specialist legal translators) and we're looking forward to lectures in the autumn given by Jeff Heasman and Mark Childress. We always apply to the ATA and the Dutch translators’ association NGTV for continuing professional development points. And our latest project (still in its infancy) is to offer the services of our translators individually or in teams. More about that after the conference! Chartered Linguist Christina Guy is a Dutch to English legal translator and interpreter based in The Netherlands. As a native of the UK with long experience in providing language services in the legal, commercial and diplomatic sectors, she is a passionate advocate of efficient quality. Several years ago, she and other committed language specialists established the translators' forum Stridonium . The popularity of forum Stridonium shows that forum like this is necessary for professional translators' community. As the world is getting more and more global, translators play an important role in many business spheres.